Royal Palms Village Wine and Tapas a Gluten-Free Beer and Tapas Paradise! A few weeks ago I joined some of my favorite girlfriends at Royal Palms Village Wine and Tapas in Atlantic Beach. We try to get together to catch up on each other’s lives and share a bottle (or two) of wine. Every time we get together someone has just gotten married, just adopted a baby, is pregnant, just broke up with someone, just got back together with someone or just finished a successful event they had been planning. It is so nice to have friends you can just be yourself around. While we are all super busy, it is hard to get together on a regular basis so the time we can get together is cherished. Royal Palms Village Wine and Tapas is a great place. I have suggested it to numerous people looking for gluten-free in the beaches area. It looks like a little European bistro and they are known for their awesome beer and wine selection. In addition, their chef is well versed in food allergies and safe preparation techniques. They have a great menu which is perfect for sharing and is easily customizable depending on your needs. Prior to ordering, I had to indulge in one of their over 8 gluten-free beer/cider options. 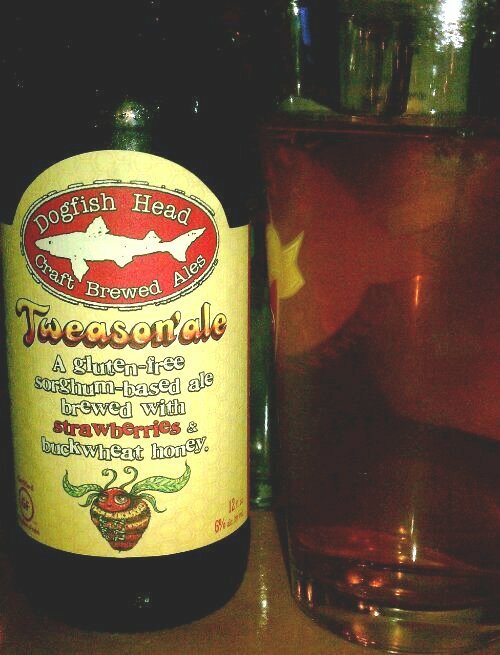 I had the Dogfish Head Tweason’ Ale, which is my new favorite. I love the soft undertones of strawberry. They have other gluten-free beers like Redbridge, New Planet and New Grist. 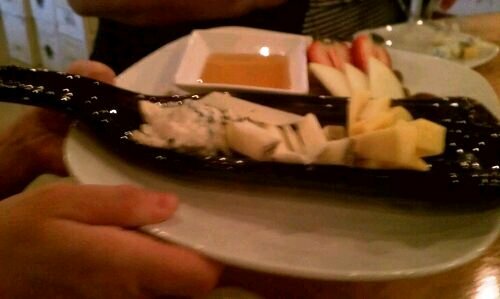 While I am also dairy-free I thought I would share that they have awesome cheese and meat plates for those of you who can tolerate dairy. 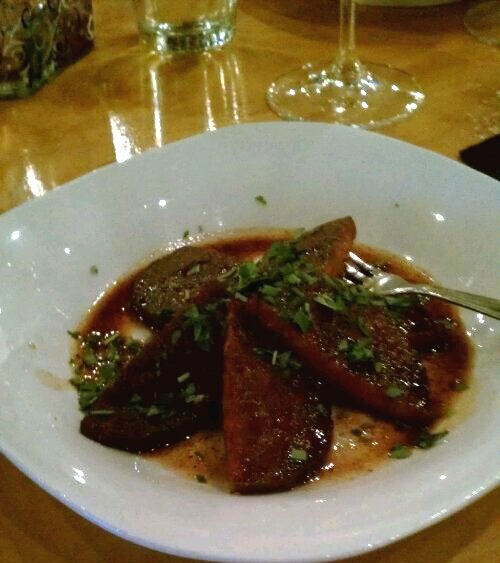 As my first course I had the Chorizo al Vino. It was delicious and nicely sized. 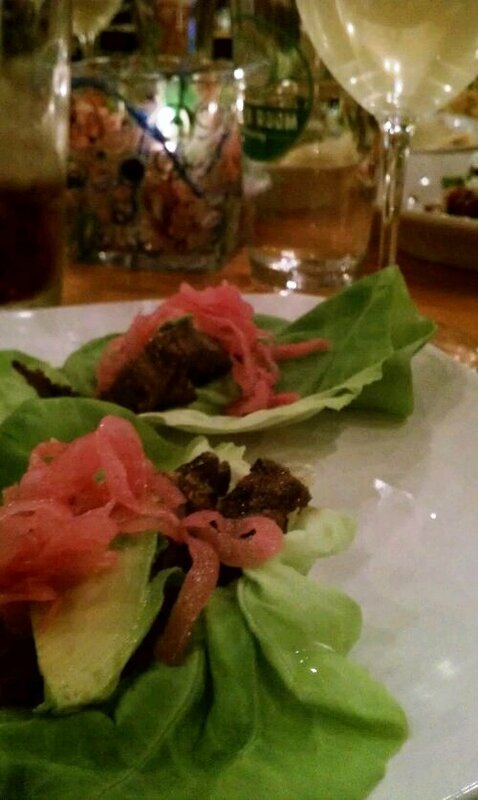 Next I had two helpings of the Angus Churrasco Bibb Lettuce Wraps. I loved how colorful this dish was, the carmelized onions added great flavor and decoration. The Bibb Lettuce was so soft and fresh, these were my favorite. A great night night was had by all. We had such a great time, that we kept the employees there past closing time because we had to share that last great story. I can’t wait to go back.